It's not uncommon to turn the TV on and when an advert appears with dogs in need feel a tug at your heart strings as you wonder how you can help. We're constantly told there is a growing animal welfare crisis. More dogs than ever are being abandoned, but we also see the good, says Kim O'Meara. We see more people than ever also willing to consider adopting a dog through dogsblog.com. We're always on the look out for what rescues are doing across the globe that's a little different and promotes a positive message, and so when we spoke with Alice Cooper's guitarist, Nita Strauss, and she introduced us to Motley Zoo, a rescue she met on the road after they visited a venue she was playing at with the king of shock rock himself, we knew we had to find out more about them and their unique approach to rescue. Hi jme, thanks so much for speaking with us! Tell us about what you do. We’re Motley Zoo Animal Rescue - a volunteer run, foster based, 501c3 nonprofit corporation based just outside Seattle in Washington. We have rescued and rehomed more than 1800 animals since 2009 and have a volunteer crew of more than 150. We work to end the problem of pet overpopulation and the subsequent euthanasia of healthy, adoptable animals. Through the direct rescue and rehoming, or providing of resources or education and spay/neuter advocacy, we’re working to save lives. We often work with special needs and medically challenged animals as well and as a result, our vet bills average $15,000 a month. How did the idea for Motley Zoo and the ethos behind what you do begin? My husband and I started fostering dogs in 2006 after we adopted a dog that was really antisocial with other dogs. We wanted to help 'fix' her AND save the life of a dog in need. Though my husband was highly skeptical - especially that I’d actually let the dog go to get adopted (I promised! ), but he too wanted to see our dog become a 'real' dog that might even play with another dog - but as a minimum, one that could tolerate others! After fostering for a few years for two different rescues, we started to theorize about some different strategies and practices. At the same time we met some other like-minded rescuers that wanted to do things a bit differently as well. I have a little 'hobby' of thinking of funny/punny business names and Motley Zoo kept coming to mind. When I told anyone 'if I ran a rescue, that’s what I’d call it', people laughed and I admittedly thought that wasn’t a bad start! I knew too that if there were 10 grant requests on a desk and all of them had similar 'humane society' or 'furry friends' type names, Motley Zoo would definitely stand out. We had to vote on it as a group of course because this was never going to be MY rescue (I knew better than to think I wanted to be the sole one in charge); it was always ours. Everyones. But I was thrilled (and very relieved) when everyone agreed that was the name. I truly think we’d not be where we are now, without that. Motley Zoo really applies on so many levels beyond just the humour - which only added to our branding efforts. We’re a motley crew of people from all different backgrounds, styles and experiences, working with all kinds of animals - not just limited to 'household pets'. Add in the core love of Motley Crue and my rock and roll music preferences (and personal style) - it was just the perfect name. It has truly been a cornerstone to our success at really branding the rescue and building the organisation. One thing we see a lot of is that certain animal charities actively choose to reinforce the image of a poorly dog with who they are and the word 'rescue' through TV ad campaigns, for example. You don't shy away from having a more positive outward image (or brand) do you. Exactly. When we founded Motley Zoo we didn't want the sad, hopeless faces to be what represented rescue. There have been studies done and it has been shown that these kinds of campaigns that play on guilt, will possibly yield a one-time donation, but rarely recruits long term support. This is because those views instantly make one feel the situation is hopeless and anything they do will never be enough - and they can't stand to think about it for very long. however if you show people a positive side and what they can really do - and that it makes a difference - you are more likely to recruit and maintain a following. We had this belief before we'd heard about any studies, but honestly, I can't even watch those sad commercials! They make people feel sad and hopeless rather than empowered and motivated to actually do something. We wanted to make charity fun, turn the idea of the scary sad shelter type vision around and make things fun and results based. The impact a charity makes is what people care about and will support - the sad part is what people can't deal with and why they will turn away. As for branding, my husband and I both come from art backgrounds and we had both run businesses. I think that's why we knew that this needed to be treated like a business - because it really is, even if a nonprofit. Charities still have bottom lines, still have to pay the bills and still have needs - but the revenue goes toward a greater good rather than into someone's pocket. But I think it is people thinking the charity is different and thinking rescue is different, because the animals are alive and not a product, that creates this mindset and it really isn't. This doesn't mean we treat animals as a commodity because we certainly don't. The animals are the customers and we're servicing them with vet care - that is the commodity. The secondary act of adopting out the animals is NOT the business - it's a byproduct. Our goal is to make sure the animals are healthy and alive - and thankfully adopting the out is an option - but we wouldn't stop doing it either way. Thankfully we can help more animals because they don't all have to stay with us, but the rehoming of animals isn't the business, helping them is. There are other aspects of treating a rescue like a business, including how the animals donations may range, for example as healthy young puppies and kittens are more desirable than older, potentially medically needy animals. There is no reason that a rescue shouldn't take that into consideration. A Motley Zoo, the younger more desirable animals top out at the higher end of the spectrum of donation costs ($400-450 for puppies - $150 for kittens) while the elderly animals are at the lower end ($200-325 for dogs - $50-75 for cats). The irony as that it costs much less to take care of puppies than it does elderly dogs, but that's how costs balance out overall - it's adopting out a few puppies that don't stay very long that ensures we can afford to spend three times as much on the older animal who stays with us much longer. Stating this out loud is controversial I am sure because people don't want to think rescues are businesses but by understanding that they are, Motley Zoo has achieved a level of success and stability that many others never will. There is a lot of locked in mindset in this line of work and you really have to open your mind and think differently to tackle the same problems. Thankfully that's just how Bryan and I work, we didn't even know that our initial strategy would be so successful, but we are proud to see that indeed our guts led us in the right direction. Have you had to overcome any hurdles? There are so many hurdles to overcome in rescue - every day the virtual doors stay open is literally a miracle! Funding and differences in personalities and ideals are probably the biggest killers of budding rescues. Being able to say no is a virtue and it is really hard to do sometimes. We started with just $2500 in seed funding that a few people chipped in on. We budgeted for $1000 cost per animal - and if we didn’t have that, we couldn’t take one. Eventually, we got down to calling it $500 per animal - and then we came across a $1500 surgery from a dog we adopted out that would die if we didn’t take her back and fix her leg. To be able to overcome those drastic ups and downs and financial hurdles is very difficult and relying on grants in this line of work will never happen. Nor can you completely rely on donations alone, certainly not the adoption donations collected to offset the pets’ care costs. Rescues have to be creative and innovative - but so many aren’t because it can be scary, it can be risky and frankly, many just can’t see the vision. Most rescues cannot make it past the three year mark. The other hurdle is people’s emotions and ego. If you go into starting a rescue thinking this is about what YOU want as a founder/ leader, think again as you will be sorely disappointed. You have to be stronger than your own ego. The other aspect is emotions. Whether they be yours, a potential adopter’s, a foster’s or your Board members, you can imagine that people who have come together because they are so passionate to have started a rescue, can be so passionate that they eventually can’t agree either. This is just the human element inside the group. Outside the group, this human element is just as hard because people are seeking something they want, but this is a living creature, not an appliance. Many times the animal they want may not be the right match or in a few cases, maybe there is no animal they could be trusted with. 'Customers' have a hard time understand that their needs are not our priority: the animals are our clients and are first on our list of priorities. As their needs are very black and white, it is easy to determine what they need - however, people and their emotions do not always make this easy, or pleasant. However rescues must stand by their beliefs and principles when it comes to objectivity - you cannot let people bully you into making choices that are less than stellar for the animals. This takes a lot of strength and conviction many people just don’t have. There is a thing called 'compassion fatigue' in service lines of work such as this, nursing, senior care and so on. Usually it is because of the terrible things you can be exposed to, the worst of the worst, the cases that give you nightmares. For many people they burn out because of that and many times cannot recover. The work is just too much of a burden to bear and many rescuers cannot last terribly long. For others it is the service aspect that tends to burn one out. For me personally, this has been an immense challenge to overcome over the years, because especially at first, I couldn’t help but take everything so personally. Motley Zoo was my baby and it hurt (on the rare occasions) when people were unhappy. Most issues honestly have nothing to do with the rescue or the quality of service people received and have a lot more to do with unrealistic expectations, heated opinions and just rudeness. Over the years, I have come to be a little less sensitive to that which I can’t control which is definitely a big hurdle some perhaps can’t overcome and I have seen it make veteran rescues very hard and cold. The passion they extend to animals just isn’t there anymore for people. You have to have a tough skin in this line of work for many reasons. The people, however, are also the BEST part about rescue work. The good people that help us save lives. The people who adopt and the relationships we build, this is what keep us going when the other stuff gets us down, There’s nothing like a happy update or picture of animals we have helped to remind us exactly why we do this. There are a lot of ups and downs in animal welfare, but it’s always worth it. What advice would you give to any other rescue looking for a way, like you've found, which helps to raise social awareness to get maximum participation and reach to new potential homes for the pets in their care looking for new families to call their own? The key is to make your group stand out from the others. Ask youself: how can you get people to want to work with YOU versus any other group. It helps to write down some key founding principles and visions. Things which brought you to the point of starting a rescue and it is very important to direct that vision and make sure the community understands it. Getting out into the community is the best way to increase exposure and recruit more support. When we first started out we did every event we could - whether community or family based, or pet specific. We made relationships with the local stores and chains and hosted adoption events there. There are benefits to really building those bonds such as locally donated food and supplies, as well as larger national grants that can help boost your efforts. Once you get more established and recognised, then you can begin cutting back a bit on what may be exposure only events versus ones where there is a direct benefit. As you get bigger, your time becomes more and more difficult to split and you will have to pick and choose, lest burn out your volunteers with too many events that don’t have a great enough 'return on investment'. For example and adoption event will adopt out a few animals but probably only bring in $100 or less in donations. But a community fair might bring in more donations and sales (of merchandise, for example) and not be focused directly on making adoptions. You might start out making $25 an hour, but you want to get to the point where you’re making at least $100 an hour for your time, or $1,000 an hour! Doing the right combination of small and larger events can be really beneficial, just don’t spread yourself too thin. At the stage in which you become more established and recognised you will have to seek support less and companies or schools will start coming to you and ask if they can help you. That’s a good feeling to have! Rescues must also focus on social media. As many of our supporters are in other countries and we’ve never met them, the key is to provide plenty of pictures and videos - not of what you NEED as a rescue - but what you’ve accomplished. People are far more likely to support an organisation that can show their effectiveness than one that doesn’t. The needs of the animals are critical, but you can’t always ask for help either. That is how donors burn out too. It is harder to recruit a new donor than it is to retain the ones who have already taken the step to give (or volunteer). Growth is painful and if it causes you to lose sight of your purpose and vision, you might need to refocus your efforts. Perfect the system you have before worrying about it getting bigger. It is perfectly okay to be a small rescue doing things great -some might argue that it's better than a large one doing things poorly. Motley Zoo has gone through many of these phases and thankfully many of our volunteers have been the same since the start! If that happens you are doing things right and if you find people don’t stay, you might need to change some things. Great programs recruit for themselves and your volunteers should be your biggest supporters! We know Alice Cooper's guitarist, Nita Strauss, met, fell in love and adopted a dog now named Motley after meeting her outside a show. Have you had any other experiences of stars adopting dogs they've met? We recently adopted to Elle King, the singer of the popular hit 'Exes and O’s'. We met her at a concert in September of 2015 and she fell in love with ones of the dogs named Inara. Inara had some health challenges and issues that were prohibitive for the average adopter. Elle would spend time on our Facebook page crying over Inara’s situation and she really wanted to adopt but suddenly had some health complications of her own that put that off. Two days after Christmas, she called and said she was on her way to Seattle to collect Inara and finally adopt her! Since then, Elle came to town (Seattle) recently and we were invited to the show and onto her tour bus to see Inara, who is now named Sugar. Sugar was SO happy to see us, jumping up and down and giving kisses (laughs). She’s kind of like a meerkat with her skinny little body and she stands up on her hind legs to get closer! She was wearing the cutest little sundress and Elle just doted over her. It was very rewarding to see such a little girl who stayed with us so long, really truly find the rock star life! We also brought two new puppies we named after her songs, 'America’s Sweetheart' and 'Love Stuff'. These are two puppies that have some neurological issues so their heads bobble a little. It’s pretty cute. They are still up for adoption on our Petango page: http://www.petango.com/motleyzoo. At the same concert in September 2015, we also met Kacey Musgraves, a country/ folk singer. She kept coming back to hold the pups and said 'I really want to adopt this one. What do I do now?'. When animals travel they need to have health certificates for flying and such, so we determined the best course of action was to have Kacey pick her pup up on her layover on her way back through Seattle the following week. There was only 45 minutes between her two flights and although the airline was super accommodating, the TSA was not. They gave our representative a hard time about delivering the dog and Kacey ended up missing her plane and had to buy new tickets for her and her boyfriend on a later flight. She knew this was a temporary inconvenience of course, but it was still frustrating! She renamed the little pup, Bambi and she has been the focus of Kacey’s Instagram ever since. Bambi and Sugar are actually sisters and the ladies plan to meet up in Nashville where Kacey lives and Elle will be passing through on her tour! Wow, that's a lovely story and so great the sisters have now got truly rock star lifestyles with their new owners. Outside of Nita, Elle and Kacey, who has been the biggest rock star dog lover you've met outside of a venue? Can you tell us any stories about when you met? 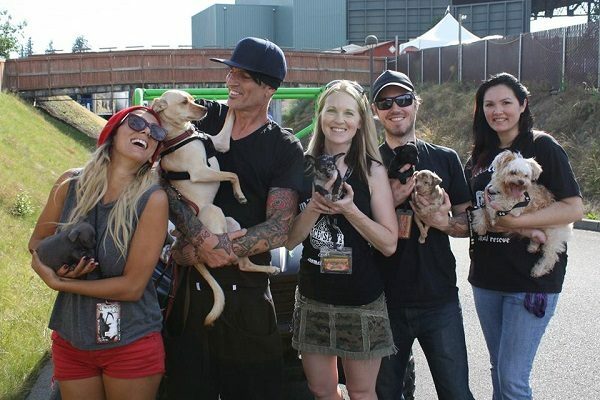 Tommy Lee from Motley Crue was a pretty awesome meet. What was really great was that he came looking for us, because he’d heard we were outside with a Motley Crue litter. He let us backstage and we told him about what we do. He was excited to share that his dog Bowie, was a rescue too - and he was actually there! So Tommy ran backstage to get Bowie and they zoomed out on a little four wheeler (laughs). It was so great. Bowie wasn’t sure what to think about the puppies but it was a pretty awesome opportunity. We still talk to Tommy and hopefully we can develop a stronger relationship. We have some upcoming plans we’d love to see him involved in. Rob Zombie and the guys from his band, Piggy D, John 5 and Ginger Fish were also really into our efforts. Rob actually has a farm, so he has animals of all kinds and the others all had pets too. Piggy D’s wife had actually adopted a dog the day before, which he hadn’t even gotten to meet yet! Philip Anselmo (Pantera originally) is also very supportive - he requests us when he’s in town, so we’ve seen him a few times. He and his wife have quite a little zoo themselves. Snoop Dogg was one of the most sporadic and once in a lifetime events. We waited three hours and finally at 3am, we were able to see him. We had cats that time, named Gin and Juice - but he was telling us how much he loves both dogs and cats (cats were more of a surprise). He didn’t want to hold the kittens, just 'look into their eyes'. I’d like to note that people believe we’re funded by these musicians - however, none of them have actually ever donated. Band crew members have made small donations or purchase shirts and such, but it is not this gravy train that some people think. We are still working very hard for every penny we earn for the animals but maybe someday we will earn some musicians trust and financial support. Which rock stars would you still love to meet? I was really hoping to meet Lemmy from Motorhead, but sadly he passed recently - Prince and Bowie too. I would like to meet Adele, Billy Idol, Guns n Roses, Bjork and Madonna. I am sure there are many more, I can’t even possibly list them! If it happens, it does - and if not, it’s okay. This adventure thus far has been far more exciting and interesting that I ever imagined possible…but hopefully we can be invited to the Grammy's sometime - that would feel like a big accomplishment! How can readers find out more and get involved? To find out more about us, check out our website, www.motleyzoo.org. If you’re not local to the greater Seattle area, look up some rescue or shelters in your area and make the effort to get involved there! I used to think 'Someday when I have time and money I will volunteer at a shelter and donate to them'. Everyone thinks they don’t have enough resources, but that’s not what it takes! One day I looked at my foster dog and I suddenly realised, 'Someday, is EVERY DAY when I foster an animal'. I didn’t need a ton of time or money - I just added a little furry face to my home, and suddenly the word was different. MY world was different. Suddenly I was more purposeful, my life had more meaning, I felt more accomplished because I saved a life- by changing so little on my end. Sure the lives of the animals are changed dramatically by volunteering but so many people miss out on the fact that the best change might just be for them. I honestly feel sorry for people who never take any time to pursue some kind of volunteerism, because it’s a gift you give yourself. I think it is one of the secrets in life to being happier in general. Sometimes 'fitting in' one more thing like volunteering makes you realise how busy you might be with things that really don’t matter and aren’t fulfilling you otherwise! Like animals open a door to your soul, so does the selflessness of supporting rescue in whatever way you can.